For wholesale orders (15 copy minimum), please go here. GETTING DIAGNOSED WITH GESTATIONAL DIABETES IS SCARY. Imagine easily managing your blood sugar, effortlessly gaining the right amount of weight during your pregnancy, and giving birth to a beautiful, healthy baby. With the wrong information (or no information at all), far too many women struggle with erratic blood sugar. This can lead to excessive weight gain, high doses of insulin or medication, and difficult births. Sadly, this often happens despite following the dietary advice given by well-meaning clinicians; a restrictive diet that leaves them feeling unsatisfied, unhappy, and confused about their blood sugar levels. 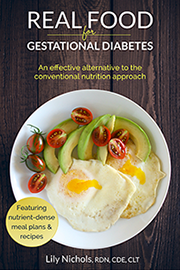 In Real Food for Gestational Diabetes, registered dietitian and gestational diabetes expert, Lily Nichols, sets the record straight, offering revamped carbohydrate recommendations and exercise guidelines based on the latest clinical research. With this book, you have the tools to turn this diagnosis into a blessing in disguise. Why conventional diet therapy often fails and what to do instead. How the right prenatal nutrition can reduce the likelihood you’ll need insulin by 50%. This book is the missing prenatal nutrition education that you’ve been searching for. Pregnancy is full of unknowns, but one thing to remember is that good nutrition “stacks the deck” in your favor. Whatever the outcome, you know you did everything within your control to have a healthy pregnancy. Eating a nutrient-dense diet of real food sets you up for a healthier pregnancy, a smoother recovery from birth, and an easier transition into motherhood. Let me show you how. I had gestational diabetes with my last pregnancy and followed the dietician’s recommendations very closely… I ended up on insulin a few weeks before I was due, which transferred my care to an OB and I wasn’t able to have the home birth that I wanted. So for this pregnancy, my husband and I prayed much that God would help us with the diabetes. I found your book, then your website, and then bought the course. Thanks to your real food approach, I was able to manage my glucose on my own through diet and lifestyle (no insulin this time) … I had a glucometer and the strips and tested myself regularly (the glucometer was my accountability partner;-)). I’m so pleased to share we had a normal vaginal delivery at home with the midwives aid… it was such a more relaxed pregnancy and birth experience! Also, I found gestational diabetes to be a blessing in disguise. I now have a lot more practice and knowledge about how to take care of my health even outside of pregnancy and I’ve dropped some bad habit foods that I had before pregnancy, the biggest being sugar. I just wanted to say thank you! I recently gave birth to my 4th child (my second with GD). I was eating mostly paleo-ish prior to pregnancy and kept it up through pregnancy minus the occasional cupcake :). I don’t know whether my diagnosis was accurate due to my paleoish diet. Regardless…I failed the test and had to keep track of my blood sugars. With our 3rd baby, I ate a whole foods diet because that’s just how I cook, but I did follow the carb counts that my dietician recommended. With that pregnancy, my sugars were just fine too. With this pregnancy, I was eating much lower carbs throughout the whole pregnancy not just at the end after I failed my test. I stumbled across your book as I was preparing my question list for my first appointment with the dietician. I read it as fast as I could and found that most of what you recommend in your book, I was already doing. I was relieved and I felt I had some ground to keep doing what I was doing. I ended up seeing the same dietician as I did with my 3rd child. She gave me the same advice as before. In fact, she told me to eat more carbs and gave me the green light on adding in bread and a little bit of added sugar. She looked at my food log and said I was eating far too few carbs and warned me about ketosis. I went to my appointment with questions about how a paleo diet worked with GD, how I could possible have GD with an A1c of 4.6 (I had it tested three times during pregnancy. 5.1 at 10 weeks, 4.8 at 20 weeks and 4.6 at the same time as my glucose tolerance test around 28 weeks), was it possible to fail the tests because I just wasn’t used to eating lots and lots of carbs, were there natural remedies that I could try, how could a person to eats clean and is pretty active have GD etc. She had no answers. She just told me to get my 175 grams a day and keep eating my whole foods diet. I was highly dissatisfied that she didn’t have any answers to my questions. I tried to eat 175 grams of carbs. It was so hard. I found myself feeling like I was force feeding myself. Not to mention, it was affecting my blood sugars. I was reaching the 120 mark most of the time, but I had been accustomed to a 100 reading at the 1 hour mark and the low 80s at the 2 hour mark…and I liked being under the target. I could see that if I continued to follow her advice, I’d be in the “failed diet therapy” category, so I went back to my paleo-ish ways. Week after week, our baby was growing steadily in the 50th percentile and wasn’t showing any signs of being effected by my blood sugar. Our 4th baby was 7 lbs 14 oz and his blood sugars were perfect each time they tested him after his birth. (Our 3rd baby, who I followed the 175 grams rule with was just over 9 lbs.) He was proof to me that how I was eating had served us well and protected us from the risks involved with uncontrolled diabetes and the risks associated with diabetes medicines. I want to thank you for empowering me to follow my gut, to trust whole foods, and to be a little bit of a rule breaker and step away from conventional diabetes advice! Lily, It was your book and blog that helped me control my gestational diabetes during my last pregnancy. It was the only thing that made sense to me! I couldn’t believe the dietician was recommending that I eat so many carbs! Logic tells me that carbohydrates raise blood sugar and that eating them would cause my blood sugar to spike. I think I had a mild case, but I also think if I’d followed their recommendations, I would have been on medication before I delivered. Eating healthy, whole food was (mostly) easy when I was doing it to keep my son healthy. After he was born, I slipped back into bad habits, but I’ve recently returned to a low carb diet. I’ve lost 28 pounds since the beginning of June by following this plan. Lily, I realize you probably receive many emails like this, but I felt the need to write to you anyway to say thank you. As my daughter turned 5 months old yesterday, I am reminded what a lifesaver you were when I was diagnosed with GD and wanted to take a minute to personally thank you and write a bit of a testimonial. Although I knew I was at risk for GD (over 35, family history of type 2 diabetes…), I naively thought my healthy lifestyle would keep me safe from the diagnosis. I was active prior to and throughout my pregnancy, had a healthy weight to start, and at 28 weeks pregnant had only gained about 20 pounds. I delayed taking the glucola drink that my midwife gave me at the start of my 2nd trimester thinking it was probably a waste of time… When I got the phone call that I had failed the 3-hour glucose test, I was already 28 weeks pregnant. Even though I knew I was at risk, I still felt like a failure. I felt guilty thinking I had been harming my baby for all the weeks I wasn’t monitoring my BG, and worried about what it meant for the rest of my pregnancy and the future health of my baby. My midwife instructed me on how to keep a food log and track my blood glucose, and advised me to eliminate foods that caused my BG to spike beyond the recommended levels. Two weeks later, I showed up to my appointment with her in tears. EVERYTHING seemed to make it spike – even the “hippy” Low GI granola I bought to mix with greek yogurt, and the orange I had for “dessert” (after a dinner of chicken and kale) caused my sugars to spike. I was measuring my BG 10 times a day because I was so anxious. I had so many questions for her that she couldn’t answer, so she suggested I see a specialist who could. I dug into research to prepare myself for the meeting with the specialist. My main question that NOBODY could answer was: is it more harmful to eat a low-carb diet or to go on insulin (after-all, insulin is natural)? By that point I figured the only way to keep my sugars down was to essentially eat a keto-diet. The specialist told me that eliminating carbs was how we treated diabetes in 1900, and recommended I see a nutritionist who would outline a diet plan for me with a set number of carbs at each meal… This is when I bought your book. My number one reason to avoid insulin was because my midwife said it would mean I was no longer a candidate for a midwifery birth. I knew the meal plan I was given would put me on the path to receiving medication to control my sugars. The most crushing thing about getting a GD diagnosis was that it automatically labeled me “high risk”. The consulting OB with my midwife had at one point said he would want to induce between 39 and 40 weeks gestation if baby didn’t arrive naturally before then. All-of-a-sudden my pregnancy was feeling like a medical condition rather than a human one. It made for a stressful last trimester. With your help, I felt confident that eating low-carb (less than 100g/day) was NOT going to harm my baby. I quickly learned what I could and couldn’t eat, and didn’t stress about the occasional BG spike. I ate 6 small meals a day that were heavy in protein and healthy fats, going against what the nutritionist wanted (3 large meals and 2 snacks). I realized later much of the reasoning behind the meal plans for GD is so that they can better plan for medication down the line. It seems all the GD advice is DESIGNED with the idea that it will fail, and assuming the patient will need medication. Even though the OB was still concerned about baby’s size (she was measuring an estimated 9 lbs at 36 weeks), we didn’t induce. The OB looked at my weight gain and blood sugars, and felt I had managed the GD well-enough that he felt comfortable letting me go past 40 weeks. If it weren’t for the occasional spike, he said my numbers looked as if I didn’t have GD at all! Baby girl arrived on her due date. I had a relatively short 6-hour labor as a first-time mom, and baby weighed a healthy 7lbs 13 oz (I also now know how wide the margin of error is for weight estimation by ultrasound). I had ZERO complications during labor. My midwife at one point commented that I was laboring like a 20-year-old! My daughter is a healthy and active little human. She’s growing like a string bean – tall and thin – and meeting all her milestones. At one point I was concerned that she wasn’t gaining enough weight, and her pediatrician just said “Not all American babies need to be fat babies.” I only wish I had been prepared earlier for the GD diagnosis. I feel like my third trimester was the healthiest of my pregnancy due to your nutritional advice. I gained 25 lbs overall during my pregnancy and had ZERO swelling in the third trimester. I even had LESS heartburn than in my 2nd trimester. I only wish I had found your book and blog earlier. If there’s a next time, I feel like I’m already ahead of the game. I passed along your book to my midwife, so she’s better prepared for the next person like me who comes along. Up until 2016, we advised Czech women with Gestational Diabetes Mellitus (GDM) to avoid all added sugars and to limit their intake of total carbohydrates to a maximum of 250 grams per day. The emphasis was on whole grains at the expense of products from white flour. At the same time, we advised against reducing carbohydrate intake below 200 grams per day. The reason for that was our fear of ketogenesis, deemed to be a sign of malnutrition of both the mother and the foetus. A year ago, I found out via Jan Vyjidak about the results of low carbohydrate high fat (LCHF) diets in diabetes and about the experience of Lily Nicholls with low carbohydrate diets in the treatment of GDM. It turned out that my beliefs about harmful effects of ketone bodies during pregnancy, which I simply adopted as an undisputed fact, was plucked out of thin air. A year has passed, and thanks to the diet recommended by Lily, I have found out that patients with GDM mostly do not require bolus insulin.  An educational website for women with GDM, which I developed myself, has been amended, and thanks to the kind support of my colleagues, we have jointly corrected also our official dietary guidelines for the treatment of GDM in the Czech Republic. As a result, the new dietary recommendations for GDM only refer to a maximum limit of 200 grams of carbohydrates per day, there is no minimum recommended intake and in individual cases, the diet can easily be a low carbohydrate diet. Patients who have already been on similar diets before conception are advised to stay course during pregnancy, as long as the diet suits them well. I do not automatically recommend women to adopt LCHF during pregnancy per se, but it is possible to gradually adopt a carbohydrate restricted diet and avoid the need for bolus insulin. We do, however, keep a stricter carbohydrate restriction as an option in cases where postprandial self-monitoring of blood glucose suggests it is necessary. As a nutrition professor, I take my job of educating the next generation of dietitians very seriously and want to arm them with the latest in evidence-based practice. Our students take a Life Cycle Nutrition course followed by a Maternal & Child Nutrition course where we slow down and focus on some important topics specific to prenatal nutrition. After learning about your real food approach to managing gestational diabetes, combining integrative medicine with mindful eating, as well as your credentials and experience, I knew your book would be ideal for our students! 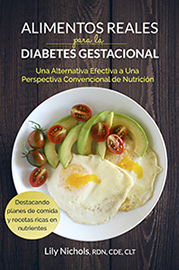 I decided to require my Maternal & Child Nutrition class to read Real Food for Gestational Diabetes alongside the Academy of Nutrition and Dietetics Position and Practice papers related to Nutrition during Pregnancy and use both to guide round table discussions and a critical reflection paper. I just wanted you to know we LOVED your book! We made several recipes in the Food Science Lab and they were all a hit. We especially appreciate your knowledge from both the clinical and research experience you have. Please keep encouraging and educating dietitians and students as you have with your book, blog, and practice! I have been a believer in low carb nutrition for almost 3 years. It’s been a hard sell to change our curriculum over the years, especially for our pregnant patients! However, it was my manager reading your book that I ordered for the office (likely enjoyed your evidenced based approach) that made her start asking the other RDs if they agreed with a change! I want to thank you for your work. A few weeks ago, my daughter-in-law was diagnosed with gestational diabetes. A friend of hers had recently also experienced it and had used your book to get it under control; her friend had a healthy baby. My daughter-in-law got the book and asked me for my opinion of your work, since I am also an RD. I could tell from your website and videos that you and I are on the same page. ???? I told her that your information is great and she should follow your book. Between her initial diagnosis and her appointment with the hospital dietitian (just a few days), she took the information from you (and me), immediately implemented it, and had her blood glucose back in the appropriate range. When she returned from the hospital RD, she said that the RD told her that she was not eating enough carbs. She laughed because both you and I had told her that’s the information she would be given. Just to check, she increased her carb for 1 meal, and, of course, her blood glucose increased out of range. She was surprised that such incorrect information is still being taught. I want to thank you for validating my information to her. It was not just from her “mother-in-law”. Take control of your gestational diabetes, naturally! Learn how in this free 3-part video training.